Inside Out will open in Australian cinemas on June 18 and is distributed by Walt Disney Pictures. Opening in the United States on June 19 and United Kingdom on July 24. Disney Pixar's latest creation, Inside Out is a truly incredible piece of work that is as deep and emotional as it is hilarious and enjoyable. Since Riley (voiced by Kaitlyn Dias) was born, she has never been alone. She has always been accompanied by Joy (Amy Poehler), a micro-being who lives inside her mind and gives her the gift of seeing the happiness in situations. Over the years, Joy has been joined by Sadness (Phyllis Smith), Fear (Bill Hader), Anger (Lewis Black) and Disgust (Mindy Kaling) who all make up the voices in Riley's head. Joy has always been the dominant voice in her mind, until the day that Riley's family move to San Francisco and everything changes. Suddenly both Joy and Sadness are propelled out of the control centre in her mind and have to find their way back before Riley makes a terrible decision. Inside Out teaches children some harsh life lessons in the sweetest and most enjoyable of ways. A life is never made up of happiness alone and sadness must exist in order for true happiness to exist. Even though we as people are programmed to believe that all negative feelings are wrong and we must stop them taking hold of us, this film seeks to remind that these emotions must exist alongside happiness and to feel them is all part of life. Happiness and sadness are an non-negotiable pairing as one cannot be felt without the other. Sadness is unavoidable in life and is felt most in situations that are out of our control (such as Riley's family moving), while happiness is often a choice and is many a time an outcome of situations which are in our control. Yet, there are also times when we feel somewhere in between happy and sad, which tends to happen a great deal in the early teenage years as in seen in Inside Out. The film also seeks to remind us that we cannot be happy all the time, despite how hard we try and this is okay. The idea of sadness and other negative emotions being inevitable no matter what in life is a rather harrowing notion, yet the imagination of directors, Pete Docter and Ronaldo De Carmen has found a way of making these facts of life seem not so daunting in an incredibly enjoyable fashion. 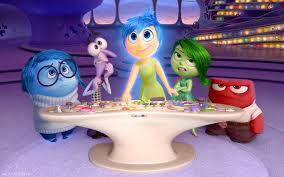 Inside Out's screenplay is brilliant as it is extremely original and creative. A visual representation of the psychological aspects of the mind and what makes us who we are in the form of five mini-humans living working a switchboard in our minds and living in a world where our imagination is much like a theme park is so incredibly clever and executed in perfect fashion. The journey that Joy and Sadness take through Riley's mind is a great deal of fun and very funny as it includes the explanation of how dreams are created, the evolution of the dream boyfriend and how and why we get that annoying song stuck in our heads when we can't remember more important things. 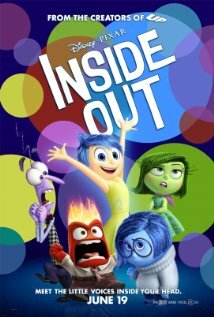 Yet, Inside Out is also very emotional, particularly towards the end and it is such an innocent sadness that is felt so strongly by adults as a result of such relatable characters in situations that you understand. As a result of how deep Inside Out is, it's true meaning may be lost on younger members of the audience. Yet they will still appreciate and enjoy the film for it's bright and beautiful colours and interesting and well planned out scenery. Again, Riley's mind is much like a theme park with lots of fun to be had and crazy characters wandering around, such as her childhood imaginary friend, Bing Bong (voiced by Richard Kind). Amy Poehler is vocally a fantastic leading lady in the form of Joy. She brings her comedic style which she is known and admired for to her character making Joy more than just a happy figure, but also one who has a great sense of humour and feeling that extends beyond her namedJonas emotion. Phyllis Smith provides the perfect voice for Sadness, with a dry, blue tone which doesn't change throughout the film but this is without bother as it gives Sadness real character and she is rather comical without really meaning to be. Inside Out is an extremely rare film that is not only wonderfully creative, but gives the rare gift of making the inevitable emotional turmoil of life seem not quite so scary. It's colourful characters and landscapes will be love by younger children, but it's deep themes will be felt and appreciated by older audience members.